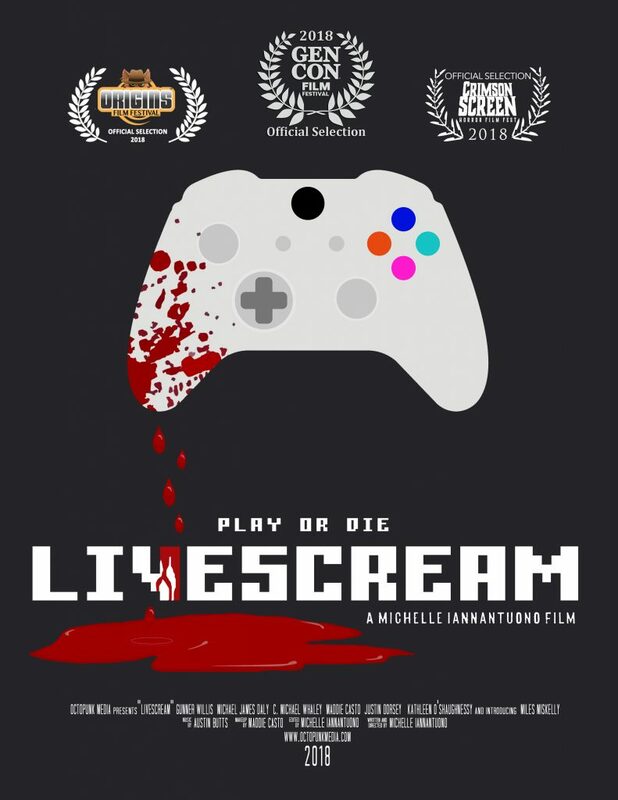 Livescream is a 2018 horror feature written and directed by Michelle Iannantuono. It premiered at the 2018 Crimson Screen Horror Film Festival in Charleston, SC, where it took home three awards – The Jury Award, Runner Up for Audience Choice, and Best Actor. It has since won over a dozen awards at festivals, and has been nominated for “Best Indie Film 2018” by both Gruesome Magazine and The Rondo Horror Awards. Additionally, Livescream is an official selection for a number of film festivals, including the 2018 Nightmares Film Festival, 2018 Genreblast Film Festival, and 2018 Gen Con Film Festival. It has accumulated multiple other awards and nominations, including several additional wins for Best Actor and Best Feature. Gunner Willis (Ozark, Vice Principals) stars as Scott, a popular video game streamer. Every day, over 200 loving fans watch Scott play horror games online. After a lifetime of failures and false starts, streaming games is the only thing he’s good at. It’s the thing he loves the most. Until it becomes a nightmare. Enter Livescream – a mysterious horror game sent to him by an anonymous fan. At first, he thinks the game is a low quality indie title. But when his followers start dying one by one, he soon realizes the game is far more sinister. Now, Scott will be forced through nine levels of video game hell, each level representing a different horror game niche, in order to walk away alive. It might just cost him his fans, and his soul, in the process.